Not without errors, but definitely better than 75% and pretty simple to use. I didn't modify the colors or resolution of the image and just uploaded it as is. Pretty sure it's more of a simple "Several broken robots found." 数体 here meaning several. It's the ～体 counter. 使用不能のロボット1体発見 would be "One broken robot found," for instance. So we've been keeping things active kind of behind the scenes. If you've been following me or hollowaytape on Twitter or you've starred our github you'll see that we've been making progress. On the translation front: Appareden's draft is complete. There's still a lot of work that needs to be done on it, but my main goals are to do a consistency/sanity check first and make sure everything's in the right place, and then do a proofreading pass to make sure it actually sounds good. We've recently switched to a more collaborative platform than Google Sheets that's actually specifically for translating stuff called Smartcat, so we're expecting to make decent progress going forward, time permitting obviously. I still have to translate 4 poems from the game that I've been procrastinating on more than the script, but I'll get to those soon. On the hacking front: Hollowaytape is actually narrowing in on a Pachy98 1.0 release, which will include a method of generating a config JSON as well as all of the required patch files for a given project automatically by just putting the original disk image and the patched disk image into a command-line parameter. It's not perfect and won't cover all of the cool cases that Pachy98 can support, but if you've just got a very basic patch for a PC-98 game you want to make, it should make that almost painless. For Appareden though, he just recently finished his first full playthrough of the game in English. Still a lot of small bugs to be squashed, and we even ran into an emulation bug involving NP2 FMGEN that we've managed to fix (it involves a screenshake right before the last boss), but it does work perfectly in SL9821 and NP21/W. Still confirming Anex86 and T-98 Next. That all being said, we're hoping to fix the remaining bugs, get the rest of the text into the game, then starting our vaguely external testing (this is new for us, it was usually all internal). One of the last things that we're going to probably be dealing with is getting the images done. Manual and artbook will likely be much delayed this time around, sadly. Are we going to do it? Yep. But our image guy is pretty busy living a cool life, and that's a thing to be happy for him about. Overall, we're pretty pleased with where the game's sitting currently, and progress is moving forward where we can make time for it. Can't give you a release date for the patch or anything, but just checking back in to give a status update. Site seems to be working fine for me. Not sure why you're having problems. Mentioned it a few times in this thread probably, but Glodia's my favorite developer on these old Japanese PC systems. Every game I've seen of theirs had a lot of care put into them for practically every facet of development you can think of, from programming to manuals and art design. Just a really solid developer who never really got a chance outside of Japan. It's going to take us a long time to get to Different Realm out to the public though, as it has a lot of text (approximately all of our current projects combined) and we're probably going to fit in a couple of smaller projects between Appareden and it. One of the sad parts about announcing it so early, but it's good to let people know we are working on it. I wouldn't expect it for another couple of years depending on motivation and free time. Script Help and Language Discussion / Re: Need help with sentence involving "ni wa", "dekinai" and and "mono da"
ものだ is just to add emphasis or weight to whatever comes before it in the sentence. So in this case, I'd go with something more like, "This power is not one you can enjoy," as the literal version of the translation. You could also go more liberal with it and try things like, "This power doesn't exist for your amusement," or other things along those lines. What text/image editing software do you guys use to translate and export the PC-98 game manuals into English language files? Mostly we use Photoshop. Log (who handled the manuals for CRW and Rusty, as well as some scan cleanup and layout adjustments for EVO's manual that you see in the fully finished version) and I used to do scanlation together a long time ago, so a lot of the techniques you'd use in scanlation (like fixing levels, etc) are used to clean up a lot of the images, and then the text is just typeset onto the pages after the Japanese text has been removed. Log also uses one of those fancy tablets to help with redrawing and fixing up images as well. Sometimes when the manuals are simpler, we can generally just create a page template and use that with the English text. Also, we use Google to OCR the manuals so it's easier to translate them in general. Works pretty well. When we need color images and more complex pages done, we will generally ask SkyeWelse (who does all of our in-game graphics as well) to handle that and he's going to use Photoshop as well. After all of that is done, we create a PDF file containing each of the pages and that's the end of the process. Oh, and SkyeWelse usually has or obtains physical copies of the games we work on, so we get nice, high resolution scans to work from. Addendum: Also I've found out about Crimson III and its PC-98 port after checking KingMike's recent work on Crimson I on MSX. He still needs help with the translation on that if anyone in this team wishes to look into that. Crimson III was released on MSX2 and PC-88 as well as PC-98. It looks cool as and has got those gothic monster designs going for it. Unfortunately we've got a lot on our plate, and when it comes to translation I'm barely keeping up with our current projects since real work has been hitting my time pretty hard lately. Can't offer much help anywhere, to be perfectly honest. I do quite like some of those designs in Crimson III though. I'll probably look into it and see if it belongs on our candidates list or not. Here's the fun thing about ripping any kind of images from PC-98 games, pretty much every game from different publishers uses a different and most of the time proprietary image format. Hell, sometimes even games from the same publisher as well, so there's no great way to or single tool that will be able to get those specific files out of each game. That being said, there are some options that might help you with certain specific games/types. I'm going to assume you know how to use EditDisk or ND to get your images off the hard disk or floppy disk image files in the first place. If not, you'll need one or both of those. Once there, you've got a couple of options to actually view those image files outside of their games. One pretty great tool is known as MLD. It's an executable that you run in DOS in your PC-98 emulator of choice. The basic usage is "mld -c -k filename.ext". -c clears the screen before displaying the file, and -k waits for a key input before moving to the next file (hint: you can use * as a wildcard and say stuff like *.bmp to make it show all of the *.bmp files in the specific folder). There's a lot of supported files in there, so your best bet is to open up the MLDMAN.txt file and look through there. It has a list of the supported files and filetypes. That won't show you everything, unfortunately though. Your next option is to try to find a Susie Plugin for the images/archives that games support. Most Susie Plugins are for things like VNs, I've found. They weren't super widely supported, but that didn't stop a bunch of people from writing plugins for different image formats. Basically, it defines how to view an image for a program that supports the plugin type. A number of image viewers that work on modern computers support Susie Plugins (Massigra is one to try). As for where to find Susie Plugins, I've got a pretty huge archive of them but it's not ordered very well and I don't feel like distributing them, but you can find a lot of them on Vector, which is a treasure trove of old software. All that to say, there's no one tool that can do that job for you on this one, really. If none of the above work you can always find out which file is the title screen and replace that with another image file from the same game and make the game display it for you instead of the title screen. We've done that for a number of games now. I know things have been a bit quiet from us, but that's due to the fact that there's A LOT of text in Appareden that I'm still working through. The hacking portions are all going well and in place though, so once I can get through the draft we'll be into revisions and playtesting at a good pace soon after that, hopefully. No guarantees on any of that though. These things take time, as usual. In some other news, we've added a list of project candidates to our page that updates from a sheet we've been using to track things we're interested in. We posted a link to it in our recent blog post about the team celebrating our two year anniversary. Here's a link to the candidates page if you want to see what we're interested in for future projects after we clear up our current set. And here's a link to the two year anniversary blog post. Thanks for following our progress with things, hope to have more patches out before the end of the year! Just going to make some assumptions, like they were talking about loaning money. You don't need the money anymore? けん here is 件, which just means they're talking about something that they'd discussed before (money). Hey MrTagoMago, that's an unfortunate problem! We haven't been hearing any issues reported for Pachy98 so it's rare that you're having one and we'd love to help you with that. Please copy the contents of the log file Pachy98 created and send that to me in a PM and we'll try to sort your problem out. From what I've learned about Glodia games in general, if they made an FM-Towns version of the game, that is the best version of the game. It's true for the Vain Dream series, the Bible Master series, and as far as I can tell it looks true for Emerald Dragon. 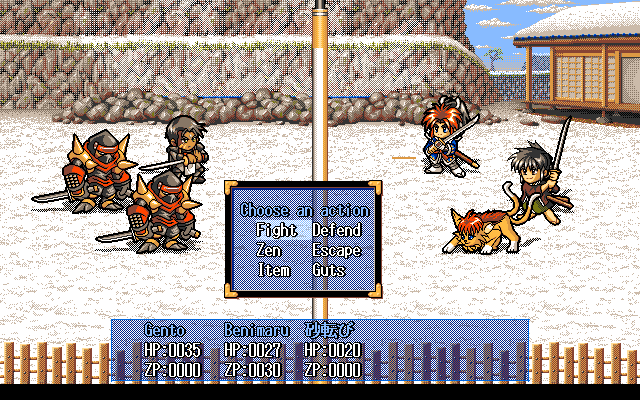 Graphics look better, they generally include much nicer opening animations, and they'll sometimes add in voice lines. All of that, with pretty much the exact same map/tile layouts, monster and story data, and sometimes even extra story that had to be cut out, which happened in at least one game that I can't remember offhand here. I haven't had a chance to check how much of that applies to Emerald Dragon specifically yet, but judging from the screenshots on Mobygames and a quick glance through a playthrough of the game, it looks decently accurate here. That being said, FM-Towns games are currently beyond our scope. Is it impossible? Nope, certainly not. 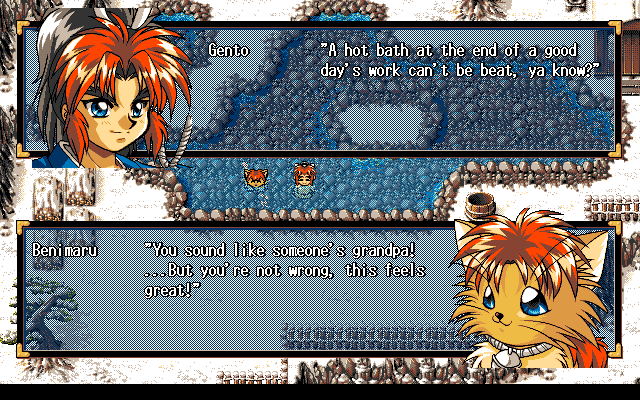 But we've got a ton of other PC-98 exclusive titles that we're looking at for the time being. We do like Glodia though, so if no one else gets to it when we're more open to games from other systems, we might pick it up. Edit: I know Nightwolve was working on the PC-Engine version of the game, but he seems to be stalled on it until "maybe" starting back on it this winter. We just announced that we are officially working on Different Realm as an active translation project. It's a pretty damn good game, but it'll take a while for us to complete. Check out these links to read more about that. We also posted up some progress on Appareden. I've finished the rough draft of the interface text and I'm going through the dialog and story at the moment (there's a lot). Check the project page for Appareden to see some status on that. Since we didn't hear too many people complaining about our updated patching process not working for them, we've now updated our E.V.O. : The Theory of Evolution and Rusty patches to use Pachy98 to help get some further testing done on it. Oh, and that's what we're calling our new patcher. We've done a rather long write up about it and are releasing a beta version to other PC-98 hackers/translators that might want to use it to release their patches. Once we've gotten some more feedback on it we'll most likely upload the 1.0.0 to RHDN as a Utility as well. For now though, check out the Pachy98 page on our site for more details on how it works and how to use it. News Submissions / Re: Translations: CRW Metal Jacket (PC-98) is now in English! It is fairly simple to make an HDI of this game, but you'll first need to have an HDI with DOS 5.0 or later installed on it. From there, you boot into DOS, insert the system disk, navigate to the disk and type HDINST. This will start the installation process (which is basically just copying files from the floppy disks themselves to the hard drive). It'll prompt you to switch disks until it's done. To run the game, run the CRWHD.BAT from the hard drive (or make an autoexec.bat file to run it automatically). You can also always use programs like EditDisk or ND to copy the files directly and bypass the installer. Edit: To be clear, you don't have to do the above to play the game. This is just the process to install it to a hard disk image file. You can easily play the game directly from the floppy disk images. Not only is it near, it's done! We updated our patching process to be even more compatible with more formats and more Windows versions, so please, please, please give us some feedback on that as we're planning to use it going forward, as well as offer it as a patching tool for other hackers in the Retro JPC community. Just posted our trailer for our next translation project, CRW Metal Jacket. News Submissions / Re: Translations: Rusty (PC-98) is now in English! The voices in Rusty are the one thing that we never got to work properly in NP2. They always crackled no matter what settings we tried, just like what you're running into now. If you really want the voices to work, the only emulator we've found to accurately and clearly output them is Anex86, though using that emulator comes with its own set of problems (it being horribly outdated and doesn't run that well for a large number of things). Tradeoffs with either choice, but those are your general options. We just released v1.0.1 which fixes the few issues that have been reported so far with the patching process (adding more informative error messages), as well as translating the GDC Clock error message before the game launches if the clock is set to 5MHz instead of 2.5MHz. Not a huge update or anything, but our patching process is getting more robust and useful hopefully. In CRW news, I'm working on revisions and hollowaytape is working on getting things reinserted. It's look pretty good so far, and seeing everything in English is pretty fun as usual.